When I first reviewed Jacques Rivette's Around a Small Mountain, my reaction was rather mixed. It just didn't hit me the way I thought it should. I gave it 2.5 stars and moved on. Months later, as it came time to put together my top list list for 2010, I felt that maybe there was something about it I missed. So I revisited it, and saw a completely different film from the one I saw the first time. Suddenly it opened up to me, and I lost myself in Rivette's delicate and tentative romance. 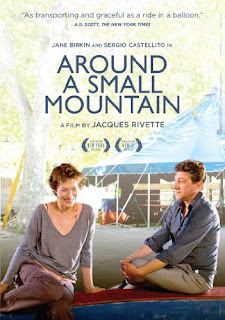 Around a Small Mountain, like so many love stories, is a film about chance encounters. But it also isn't a typical love story. This is a film about a different kind of love, the kind of tentative romance that isn't necessarily destined to end in happily ever after, but the kind that comes along at just the right moment in time. It may not be permanent, but it helps at just the time it's needed. At least that part I had right. But reading back over what I wrote afterward, I can hardly believe I'm talking about the same film. 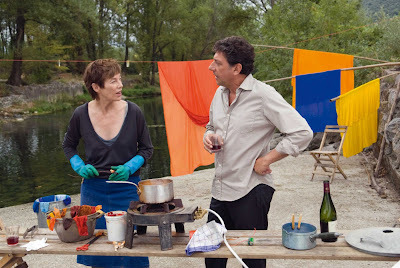 "There is a kind of effortless charm to Rivette's scenarios," I said. "But the film is awkwardly staged. It often has the feeling of a filmed play, the characters stiffly blocked as if arranged for an unseen live audience." But that is exactly the point. Around a Small Mountain is as much about the relationship between the spectator and the performer as it relates to film as it is how it relates to the circus. The "big top" here is actually very small, the audience right up on top of the performers, so close they could almost touch them. As a result, the acts take on a greater intimacy, inviting not just circus goers, but film viewers to lean forward, to be part of the action. As Film Quarterly's Rob White points out in an essay on the film included in the DVD booklet, the circus acts are always filmed from within the ring, never from outside it. In Rivette's circus, voyeurism is participation. 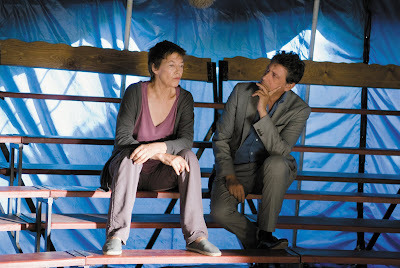 At the film's end, when the characters emerge from the tent and speak directly to the camera, they are speaking directly to us, the audience. By this time, Rivette has drawn us into his world, and rather than distancing the audience by breaking the fourth wall, he has invited us in. Around a Small Mountain is a much funnier, much more soulful film than I originally gave it credit for. Rivette is an old master whose consummate craft is alive and well in his latest film. The Cinema Guild has once again done a lovely job on the DVD. And while it may seem a bit bare bones (White's essay seems to focus more on other circus films than it does the one at hand), the film here speaks for itself. It's one of the finest films of 2010. AROUND A SMALL MOUNTAIN | Directed by Jacques Rivette | Stars Jane Birkin, Sergio Castellitto, André Marcon, Jacques Bonnaffé, Julie‐MarieParmentier | Not rated | In French w/English subtitles |Now available on DVD from the Cinema Guild.